Back in 2008, two young girls in a Midlands church read an article in CCC's newsletter The Cambodian Herald about the plight of children who were working on the rubbish dump just outside Cambodia's capital city Phnom Penh. They read how the children and their parents spent each day sifting through rotting, combusting garbage, surrounded by flies, looking for items to sell for recycling, and they wanted to know how they could help. From this seed of compassion grew CCC's Dump Kids project, which enabled 15 children to stop working on the dump, go to school and receive a cooked lunch each day. For six years our partners Pastor Sokunthea and his wife, of Boeung Tumpoeun Church of Christ, prepared the meals, monitored the children's progress at school and cared for their families. Since those early days some of the children's parents have died from AIDS and the children have been placed in orphanages. Some families have returned to their home provinces in search of a better quality of life. Some of the older children have moved on to vocational training centres. Each time a child has left the project, Pastor Sokunthea has found another needy child to take his or her place. 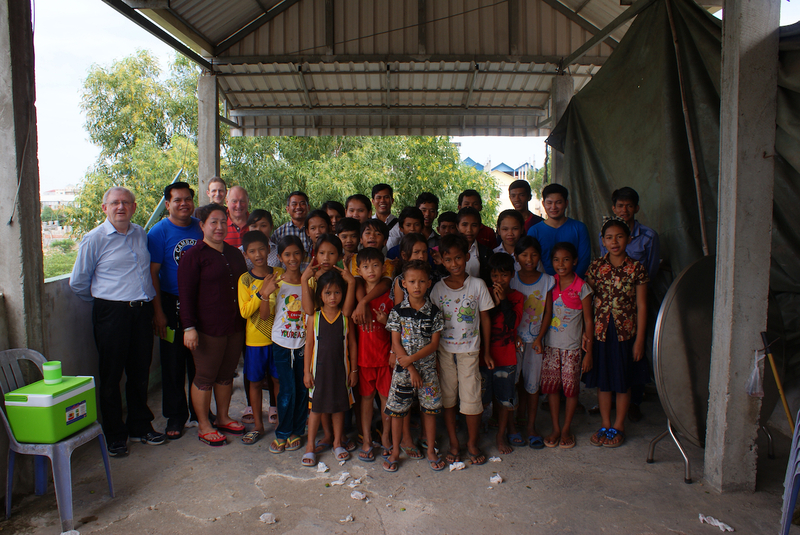 During the CCC Council visit to Cambodia in October 2014, we visited the children at the church where they eat their daily meal. We met the pastor and his wife, evaluated the project and visited some of the children's families. Some of the children are doing very well at school; others are not so gifted academically. Several of them have high ambitions. All still need our help to get through school. Access to a new rubbish dump has been restricted and some families resorted to looking for recyclables along the streets or in the garbage from markets. Now none of them work on the dump, though they remain desperately poor, so we decided to rename the project Children of Cambodia. These children may no longer be the Dump Kids but our support for their education and nourishment is still vital. We need nearly £6,000 per year to support 15 children. More money could send more children to school and improve their nutrition and health. You could sponsor a child for £7 a week. This would cover the costs for him or her to go to school and receive a nourishing lunch on each school day. We can link you with a particular child and you can have the satisfaction of knowing that your support is ensuring that he or she progresses through school and gains an opportunity to escape from the poverty in which he or she has grown up. Jesus said, "Whoever welcomes this little child in my name welcomes me." He also said, "I tell you the truth, whatever you did for one of the least of these brothers of mine, you did for me." Go to our Giving page to find the most suitable way for you to give money to support this project.